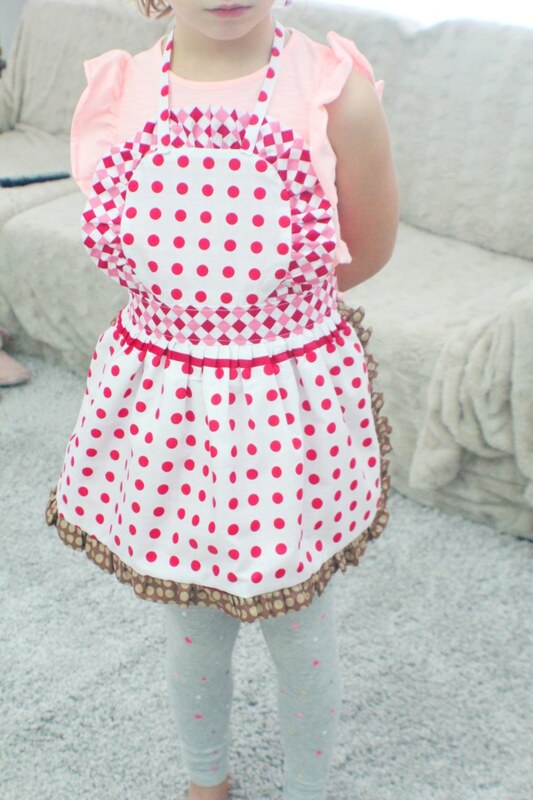 Looking for cute childrens aprons ideas? 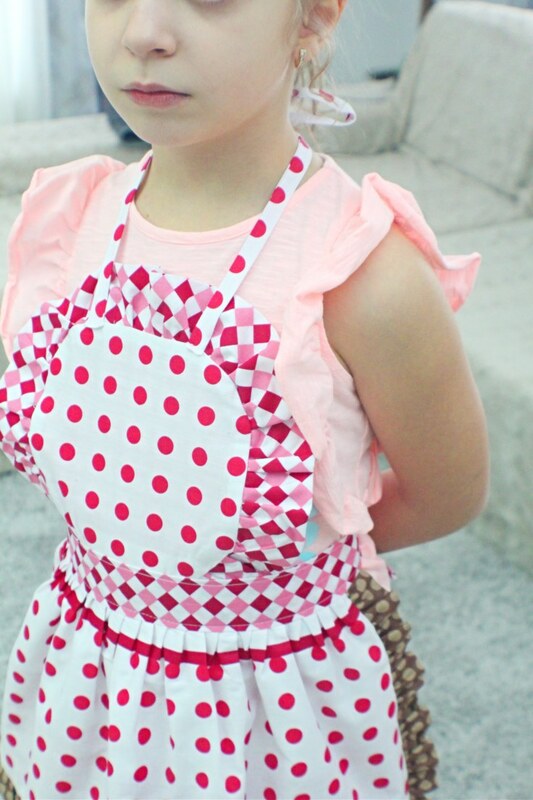 A kids apron pattern is a great gift idea, so easy to make and comes together in no time! 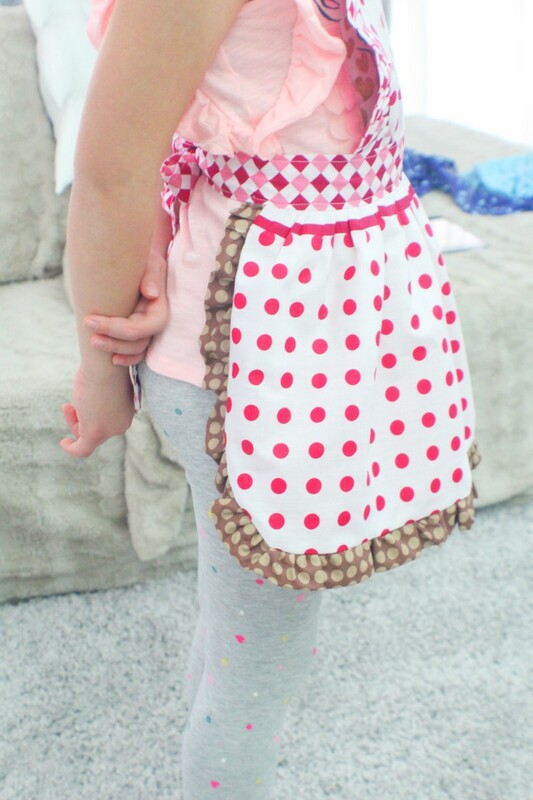 This reversible apron pattern looks so adorable, every little girl will be excited to wear it! 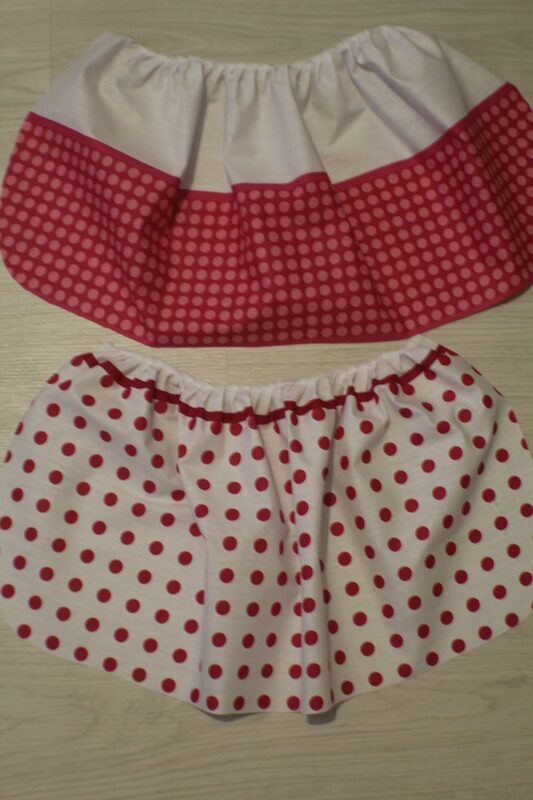 Since I spend a pretty good portion of my time in the kitchen, I made a couple of cute aprons for myself, a retro ruffled apron and a half apron. 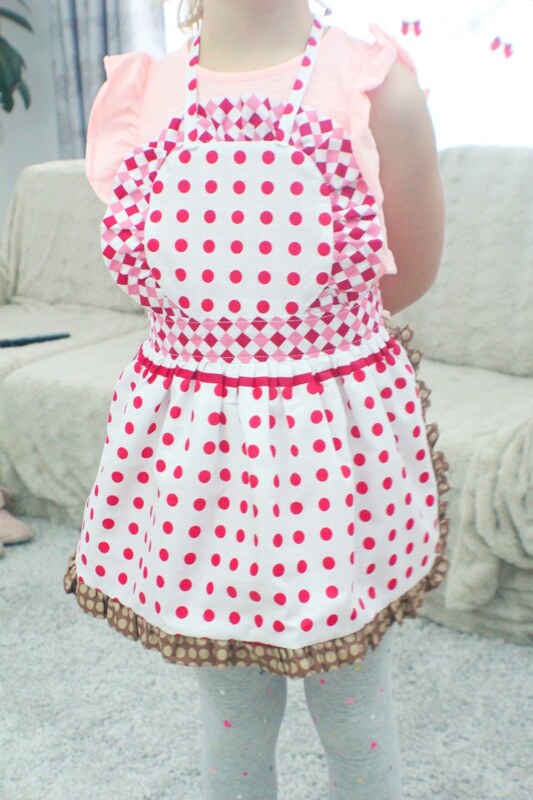 But lately Ellie showed interest in helping me with house chores, kitchen included so I thought I should motivate and stimulate her even more with a kids apron pattern! 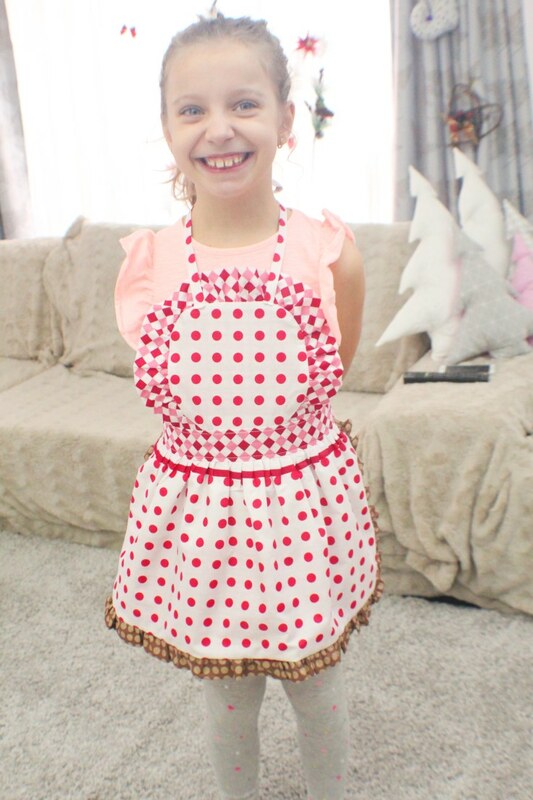 If you were on the lookout for a kids apron, I totally recommend this one (I know, I’m biased lol) But seriously, this girls apron pattern is not only super cute but so easy to make. And ready in less than an hour, so this kids apron pattern could be a great last minute gift idea too! 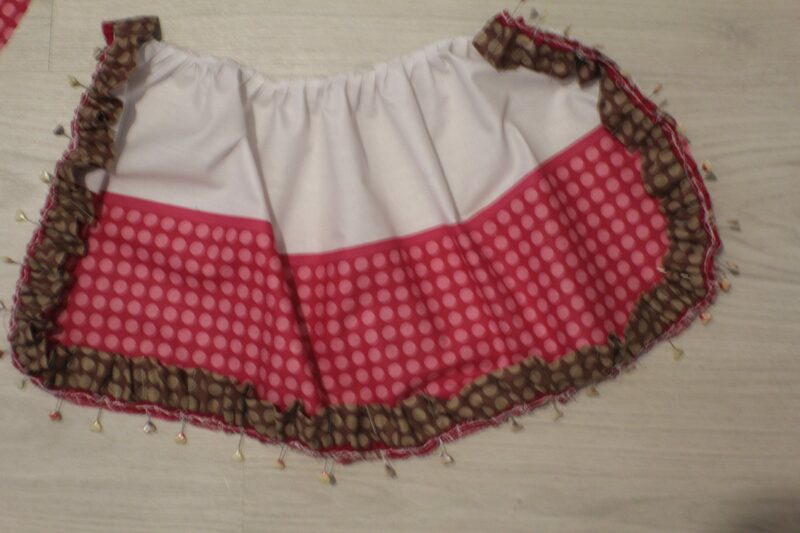 For this project I wanted a frilly apron too, as I made my aprons in a similar way. 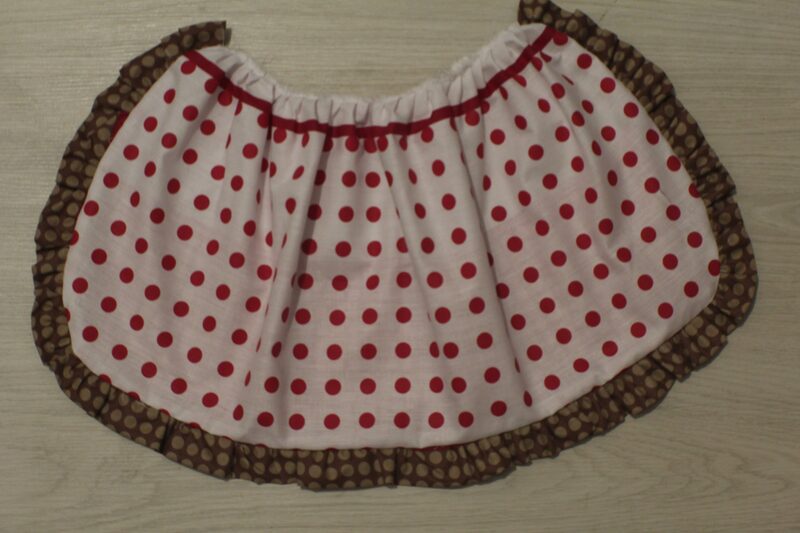 So I made this reversible apron with ruffles around both pieces, top and bottom. I used my recently purchased ruffling foot because I wanted to test and see if it’s as amazing as I thought it would be when I decided to purchase it. 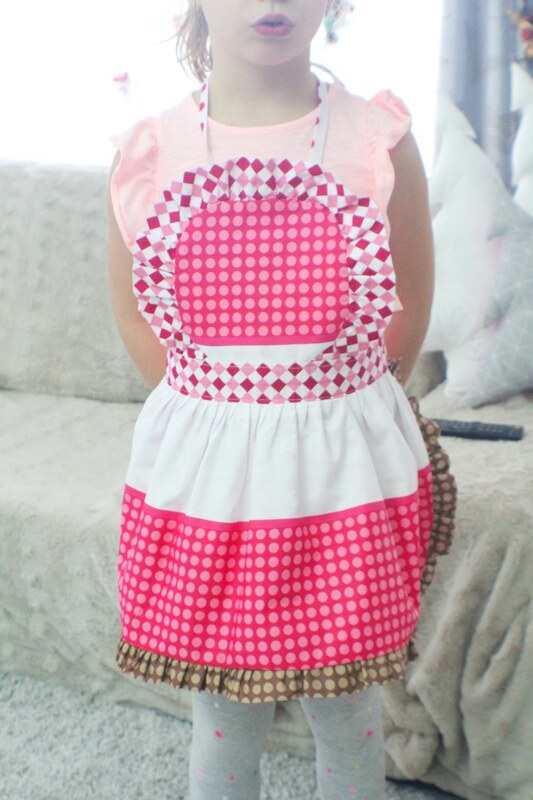 It’s safe to say that I’m more than pleased with the decision, the ruffler helped this kids apron pattern finish a lot faster and gave it a very nice touch with all those perfectly even ruffles! But I’ll get to it some other time, now we need to focus on this child’s apron pattern. If you are a beginner sewer and wondered if this is a good project for you, I would say it totally is! But only if you’ve sewn ruffles and triple layers of fabric before. This project required you to make the ruffles (if you don’t have a ruffling foot you can use this tutorial to make even ruffles) and also to insert the ruffled strip in between the two sides of the apron which can be a little tricky. So I would say this project is more suitable for advanced beginners (is that even a term?) or intermediate sewers. 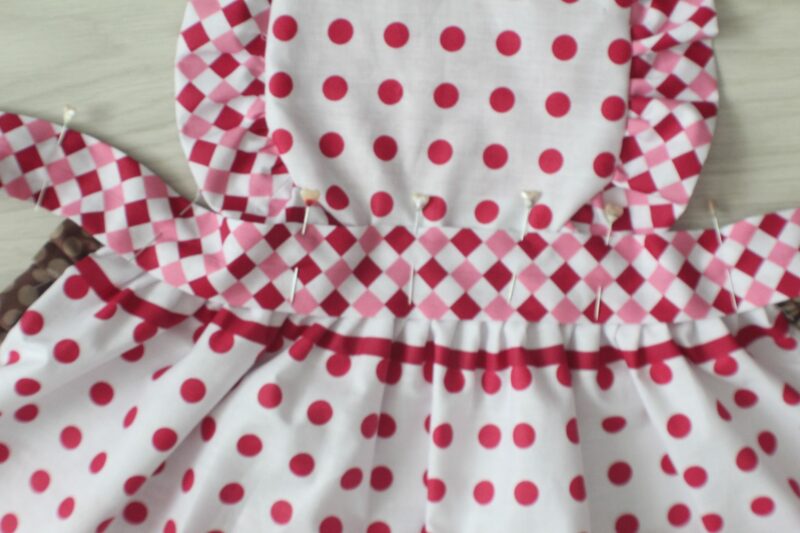 This kids apron pattern is available for purchase here but is free for my email subscribers so be sure to sign up to my sewing newsletter if you want free access to my resource library of sewing patterns. The files are password protected and I’ll be sending updates on the password in my email newsletters so be sure to check those out! For the bottom apron piece, cut 2 rectangles of about 25″ x 12″, place them right sides together and fold in half. 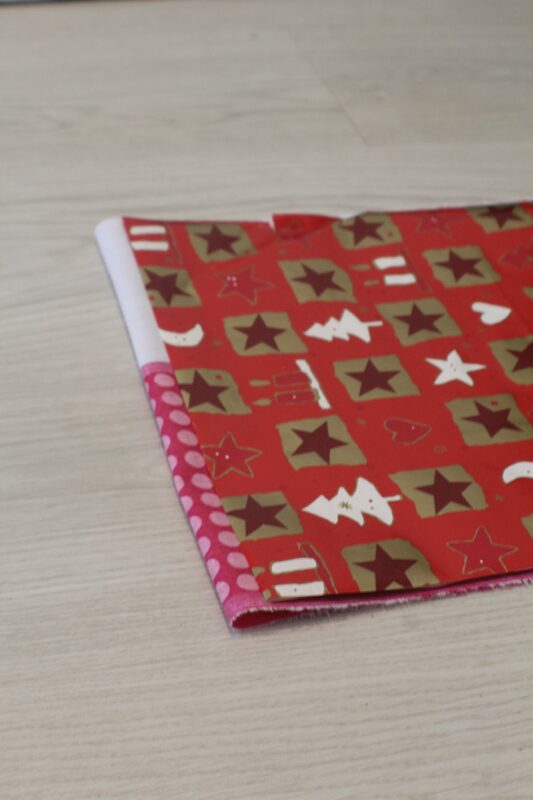 Pin the layers and place the pattern for the bottom apron on the fold. Add pattern weights, mark with a fabric pen and cut out. 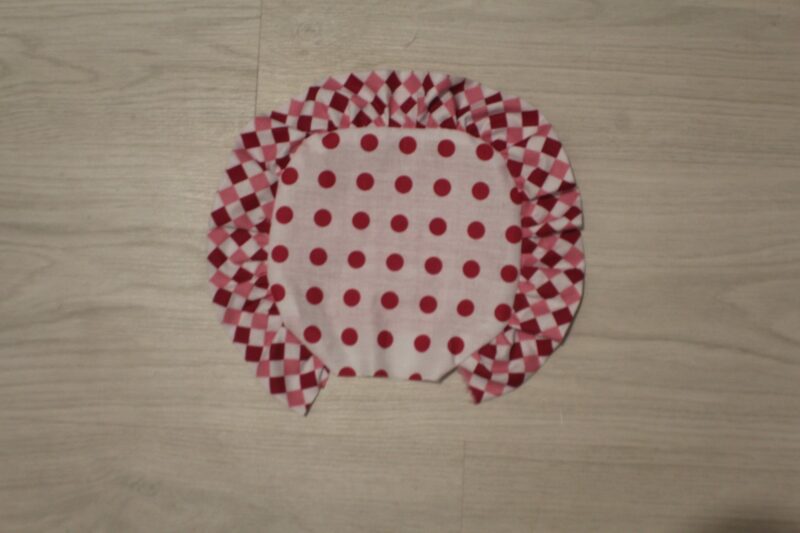 For the top apron piece, cut 2 squares of 8″ x 8″, place them right sides together and fold in half. 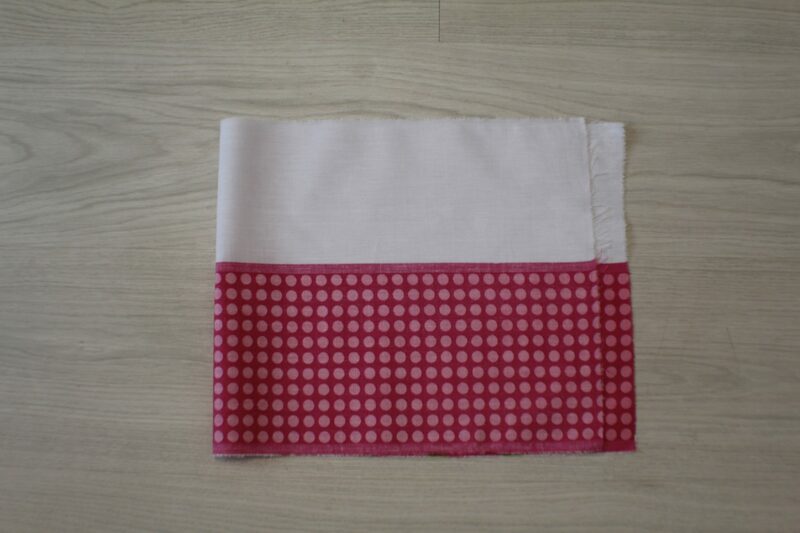 Pin the layers and place the pattern for the top apron on the fold. Add pattern weights, mark with fabric pen and cut out. 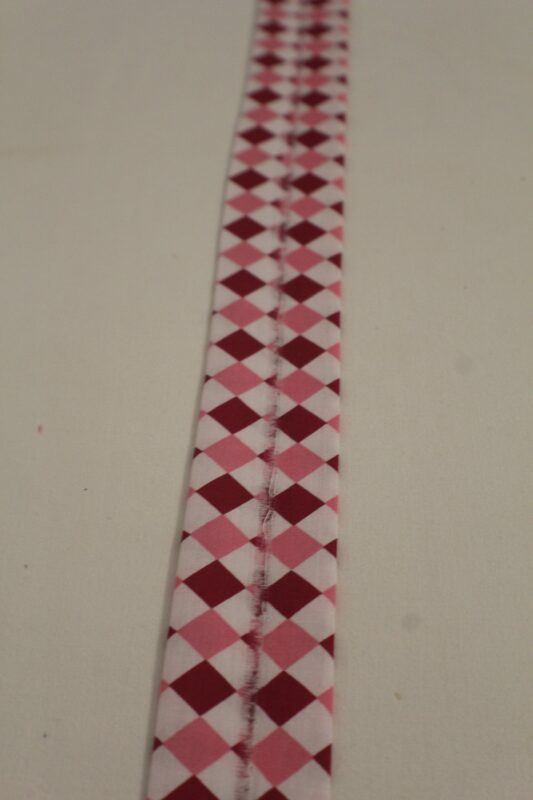 For the waistband, cut a long strip of 6 ft x 6″ and cut in half, lengthwise. Cut two more strips for the top and bottom ruffles (if you use two different fabrics; if you make both ruffles the same, cut a long strip for both). I’ve cut a strip for the bottom apron of about 10 ft x 2″ and for the top I’ve cut a strip of about 4 ft x 2″. To make the neck straps, cut two strips of 1 1/2″ x 12″ from a fabric that matches the ruffle on the top piece of your apron. After cutting the waistband strip in half, you’ll have two long strips. Take each and fold in half, lightly pressing with your fingers. Repeat for the second waistband strip. Fold the ends in about 1/4″, on both strips and press with your iron. Take each strips for the bottom and top pieces of the apron and fold in half. Using this method, your favorite method for gathering fabric or a ruffling foot as I did, ruffle each of these strips, along the raw edges. Make sure you catch both sides of the strip in your ruffling. 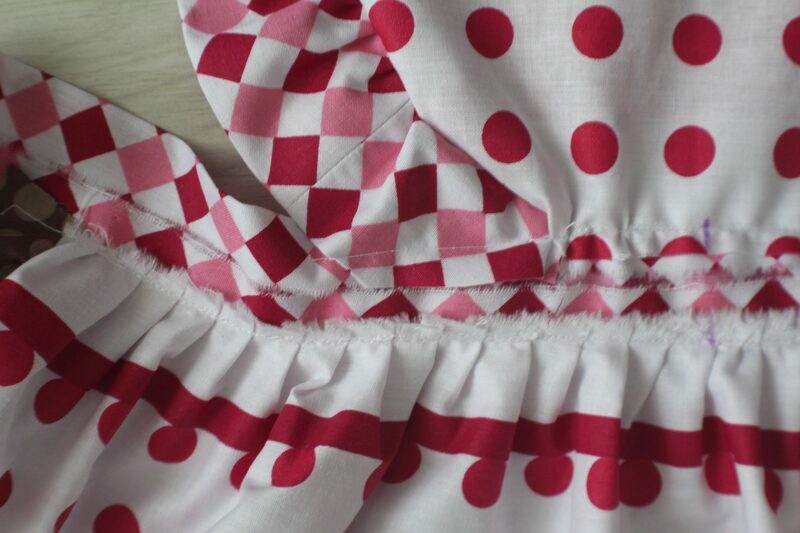 Use a 1/4″ seam allowance when making your ruffles. Press each ruffled strip with your iron on steam. This will help with attaching the ruffles to the apron pieces later on. Ruffle the top of both bottom apron pieces to reduce to about 2/3 of the initial length. I’ve set the ruffle regulator on my ruffling foot to setting #6 so that the ruffles were formed every 6 stitches, giving me perfectly even ruffles. Take one of the bottom pieces and place it right side up. 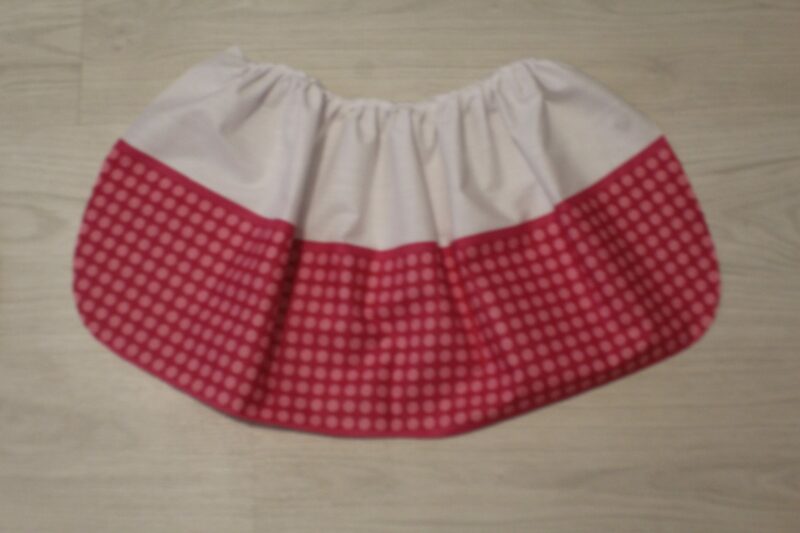 Place the ruffled strip around the bottom edge and the sides of this apron piece, with the raw edges matching the apron edges. Top with the second bottom piece, placed wrong side up. Pin again through all three layers, removing the first set of pins as you add the second set of pins (you could skip pinning the first set if you’re confident enough that you’ll be catching all three layers in one set of pins). 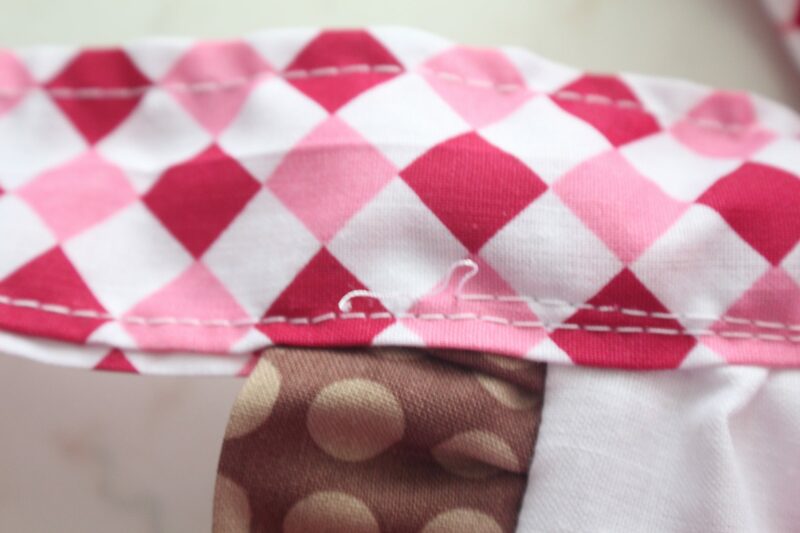 Sew the pinned area (sides and bottom), with a seam allowance that is just a little over 1/4″ (so that you go slightly above the seam allowance in the ruffled strip). Turn layers right side out through the top of this apron piece which should be open at this point. 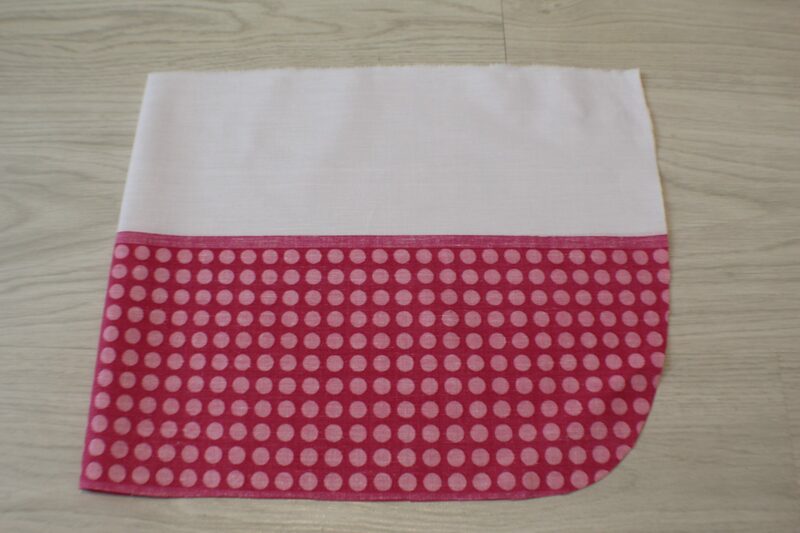 Sew the top of the bottom apron through both layers, with 1/4″ allowance. Press with your iron on steam and set aside. 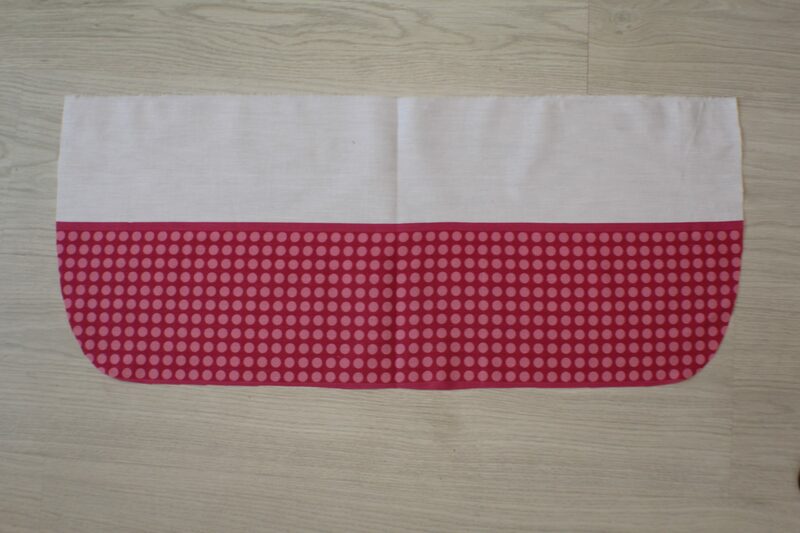 To make the top piece of the apron, you basically need to repeat the steps highlighted in the previous step. But in this case you’ll be adding the ruffles around the top and sides and leave the bottom edge open so you can turn the layers right side out. 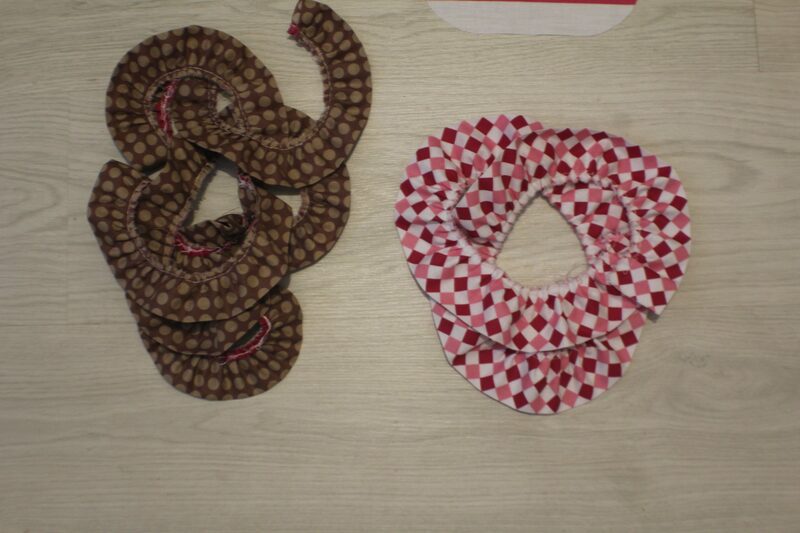 Following this tutorial to turn tubes right side out easily, make the two neck straps. I made mine 1/2″ wide. The mentioned tutorial is indicating you to sew one of the ends closed. After turning the tubes right side out, leave these ends closed. Take the open end and tie each into a tight knot. 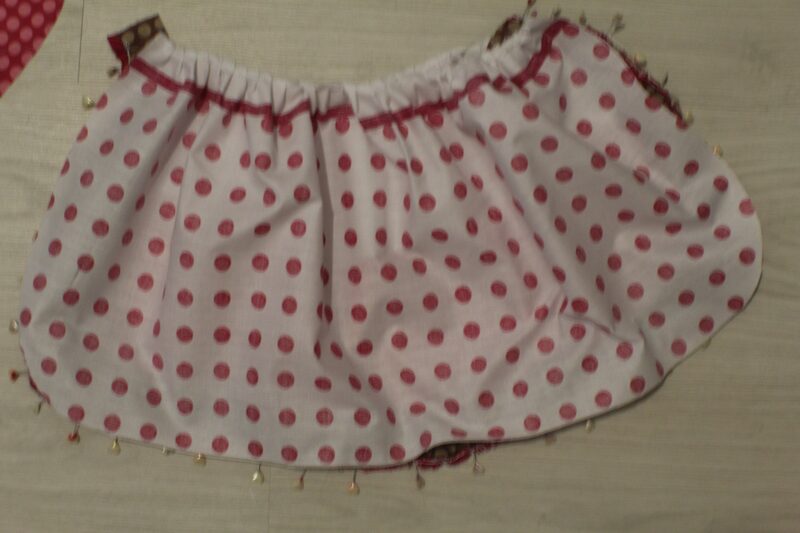 Place the sewn end of the straps right over the seam that joins the ruffles to the top apron piece. 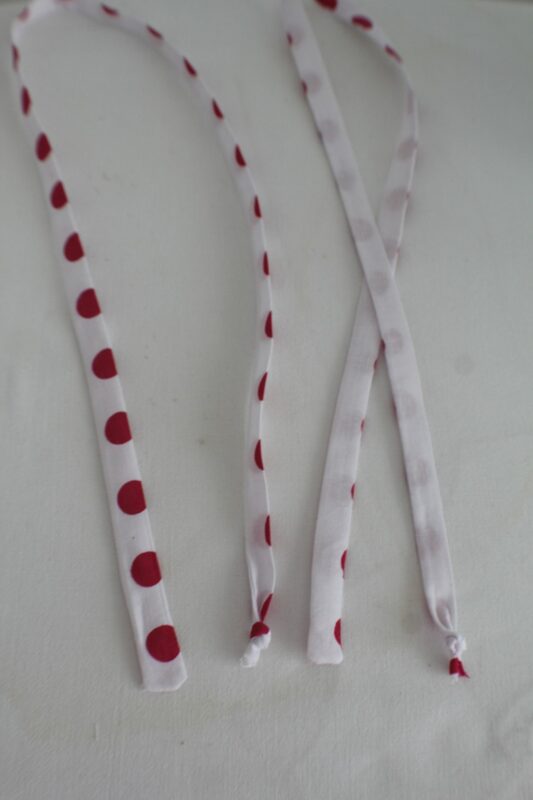 The edge of the straps should fall just slightly below the seam. Lay one of the waistband strips wrong side out. 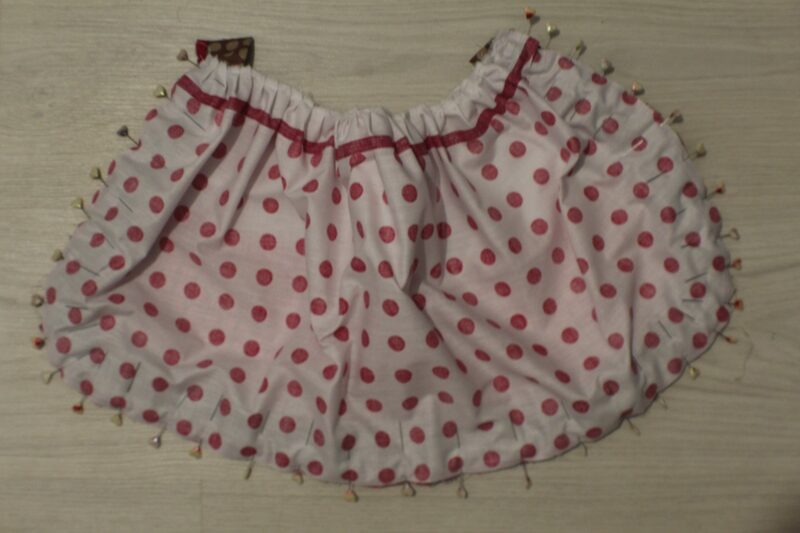 Place the top apron piece over the waistband strip, on the upper half of the strip and pin. 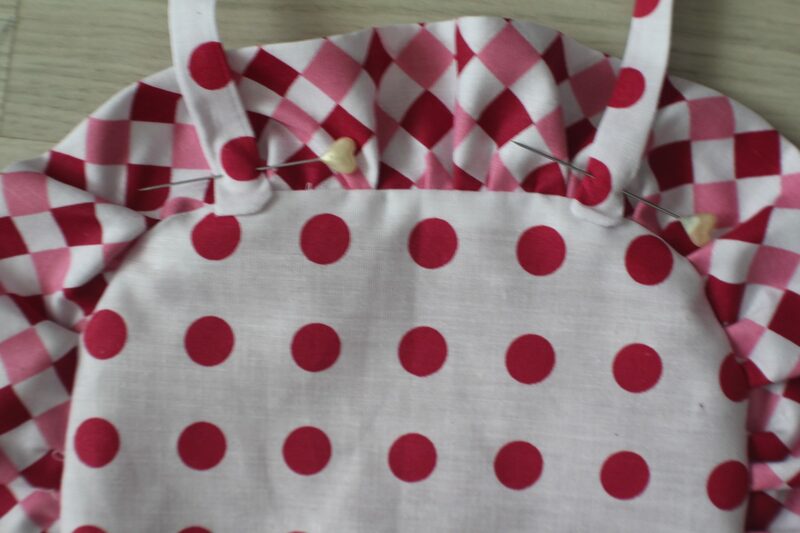 Place the bottom apron piece over the strip, on the lower half of the strip and pin. Sew a basting (temporary) stitch about 1/4″ away from both of the edges, to keep all these three pieces together, so you can safely proceed to the next step. Lay the second waistband strip right over these three pieces, right on top of the first waistband. 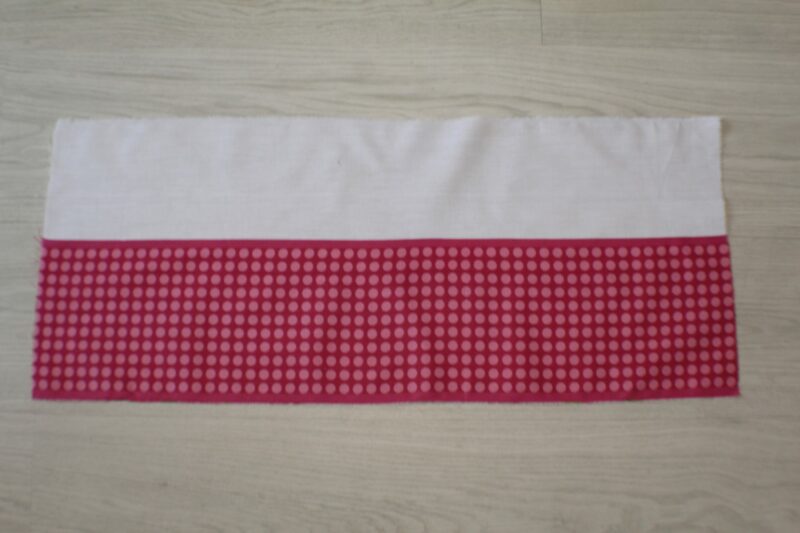 Sew with 1/8″ allowance, starting at one end of the waistband strip, going all around the waistband and finishing in the same spot as you started. Back stitch at start and end. 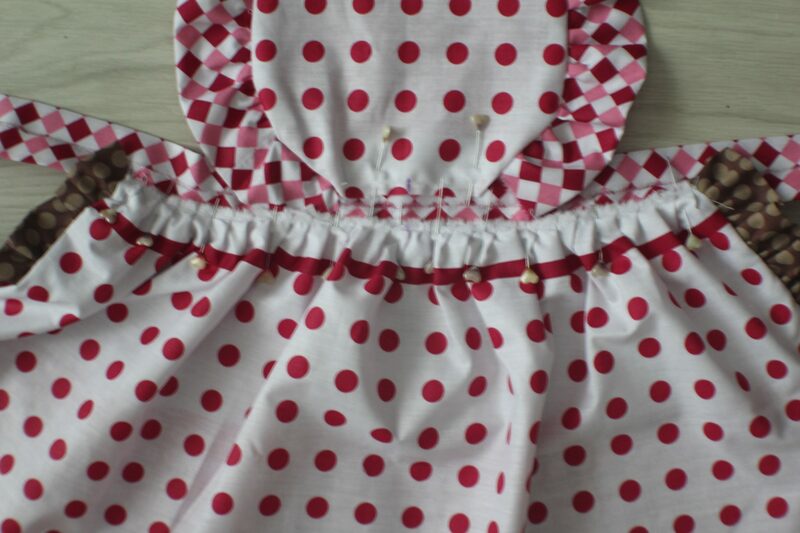 Press the apron if needed and your beautiful kids apron pattern is done and ready to wear!